Housing security and food access are two fundamentally related social issues: materially, through the experience of living with poverty and through the spatial organization of our communities; and conceptually, through discussions about the right to the city and distributive justice. 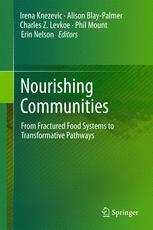 Drawing on a broad literature review and fieldwork in Eastern Ontario, this chapter highlights strategies that could address housing security and food access in a more seamless, integrated way. We analyze the case study of Peterborough, Ontario, which exemplifies persistent challenges related to both food and housing. We trace the history of social, political and economic changes that led to this situation, and explore the extent to which governments and community-based initiatives (CBIs) have tried to address it. While Peterborough CBIs have introduced innovative programs to address these two issues, a crisis continues which requires more concerted action on all levels. We conclude with reflections on the benefits and limits of looking at food access and housing security through an integrated lens, identifying new research avenues that the lens opens.